New Video: A second Brexit referendum - how would it work? The uncertainties over whether Theresa May can win parliament’s support for her Brexit deal have increased the chances that a further referendum could be called. This raises many questions: Is such a referendum actually possible given the Brexit timetable? How could it be triggered? What options would appear on the ballot paper? How would the referendum be run? 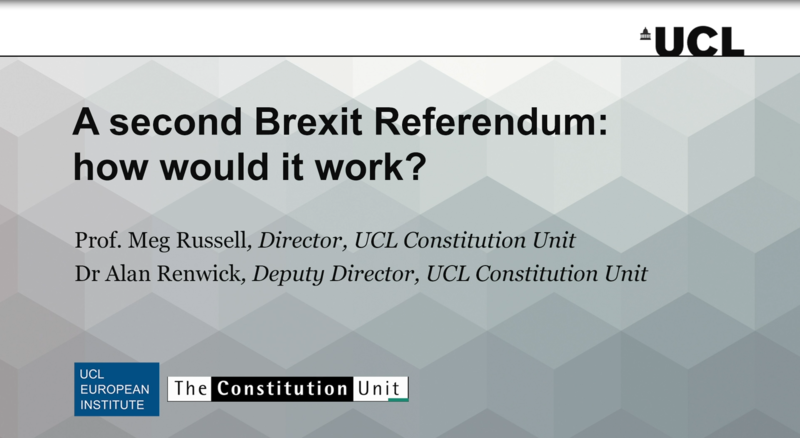 Last month the Unit published a report, The Mechanics of a Further Referendum on Brexit, which examined all these questions in detail. To help inform the current debates, we have prepared a short video, in collaboration with the UCL European Institute, summarising the key conclusions. The report is still available too, and can be read here, along with blogposts outlining each section. Full video - A second Brexit referendum: how would it work? Clip - Is a second Brexit referendum possible in the time available? Clip - How could a second Brexit referendum be brought about? Clip - What would be on the ballot paper in a second Brexit referendum? Clip - What should the rules for a second Brexit referendum be?